Cavities are an unfortunate way of life, but certainly no badge of shame. Actually, approximately 92% of adults have had a cavity in their lifetimes. Whether through improper oral hygiene, disease, or other contributing factors, cavities form as a result of decay within teeth. And, while cavities may not be uncommon, they do need to be treated properly and quickly to prevent the spread of decay. 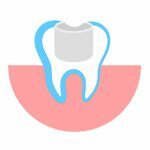 The most common cavity treatment is a simple restorative method called a Filling. Fillings are formed from either porcelain, metal, or composite materials, and do exactly what their name implies – they fill a hole in a tooth affected by decay and form a sealant and barrier. Once a cavity is properly treated and a Filling applied, further damage to the tooth and to surrounding teeth is prevented. The Dalles Dental Care staff are experts in routine Filling procedures. We can expertly and swiftly remove the decay that has led to a cavity and implant Fillings which naturally blend in with your tooth’s look and feel, and bring your smile back to its healthy best. Once we have restored your smile to its lustrous and healthy self, let the experts at The Dalles Dental Care discuss with you the best possible home oral health procedures and the best routine treatment plans to prevent any cavities from forming in the future, keeping your teeth in their best possible shape long into the future. "Great Service, great staff, and affordable options!"